The Portland Trail Blazers entered this postseason with a chip on their shoulder. After being swept by the Pelicans as a No. 3 seed last year, they look like a new team, and on Tuesday they beat the Thunder 114-94 to take a 2-0 lead in the opening series. The Blazers' backcourt continued to dominate, dropping a combined 62 points in the win. Although Paul George stepped up for the Thunder with 27 points, Russell Westbrook had just 14 (he was a rebound away from a triple double). It's been a tough go for OKC in the early games, and they're at risk of their third straight first-round exit. They'll be in dire straits if they lose Game 3. The real story of last night's win for Portland was Damian Lillard. He finished with 29 points, four rebounds, six assists, three steals, and two blocks in a completely dominant effort. On Wednesday's "Off the Bench," Danny Kanell and Raja Bell recap the entire night in the NBA playoffs with emphasis being put on Blazers-Thunder. The rivalry between Westbrook and Lillard is being owned by the Trail Blazers' start at the moment. But don't tell that to Bell. "I thought Paul George was better than C.J. 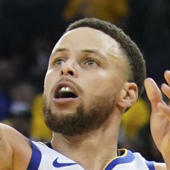 McCollum, and I thought Russell Westbrook -- and this is just preference -- I liked him a little bit over Dame because I thought physically he could do more on the court... Russ's size and stature, his athleticism gives him the ability to impact the game in many more ways," Bell said. But Lillard has shown over the past two games that doesn't matter. "If they can start making some shots, they can turn this thing around," Kanell said of the Thunder. The Thunder can turn it around, but they'll need to contain Lillard.